Russian antimonopoly watchdog suspects three airlines of price fixing | Russian Legal Information Agency (RAPSI). MOSCOW, August 10 (RAPSI) - Three Russian major air carriers are suspected of fixing prices, the Federal Antimonopoly Service (FAS) announced in its Telegram channel on Thursday. 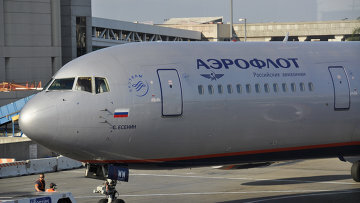 The watchdog is carrying out inspections at Aeroflot, Yakutia and S7 Airlines following media reports about alleged violations of antimonopoly law by the companies, the statement reads. In July, Aeroflot, Yakutia and S7 significantly increased the cost of passenger carriage en-route Yakutsk – Moscow – Yakutsk. FAS received requests to check the air carriers’ actions from the Sakha Republic’s Transport Ministry and citizens. The watchdog in cooperation with the Yakutia FAS directorate created a special working group to check the companies for price collusion, according to the statement. 11:56 10/08/2017 Three Russian major air carriers are suspected of fixing prices, the Federal Antimonopoly Service (FAS) announced in its Telegram channel on Thursday.